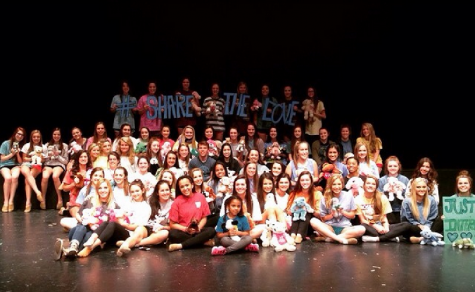 The Flower Mound High School Rosettes are back at it again this season in full swing! Every year the hard-working Rosettes perform at pep-rallies, host camps for young aspiring dancers, and travel. But then comes the time of the year for auditions. Throughout the year all Rosettes gain points for participating in specific things, dressing up on spirit days, having their required items, etc. all of those conjoined points add up at the end of the year and determine whether or not they have to tryout to be on the team again. Rosette tryouts are a multi-week process where every girl goes to multiple practices in the weeks leading up to the audition where they exercise, practice, and learn dance combos to better prepare them for the big day. Many girls who are already on the team, along with the directors, watch and try to give every girl some feedback and one-on-one practice time. Finally the night comes and all girls wear their red lipstick and put their hair up into tight ponytails and poofs. After every girl has auditioned, everyone returns to their houses and waits for the results. Then, the new team all meets back at the school where they are greeted with sparkly posters and many cameras. They all head to IHop to celebrate with a late night meal of breakfast. Once you are on the team, the stress isn’t over yet, you must work to keep your place. Sophomore and Junior Rosettes may tryout to be officers, where they wear all white uniforms instead of the traditional blue and white. Officer auditions are a whole new level of stress because this time you’re not competing with a score, you’re competing with each other. Officer tryouts are competitive and spark a whole new level of determination in the girls. I think that a great way to help ease the tension would be to really highlight every girl and make every person feel special, talented, and supported. One thing is for sure though, the bond that the girls on the Rosette team have is like no other. They will always support and lift each other up no matter what.